Alosca Technologies has added another innovative inoculant product to its range with EasyRhiz soluble legume inoculants. With growth in the number of liquid kit setups on seeding bars growers are taking the opportunity to deliver legume inoculant in-furrow via direct liquid injection onto the seed. Legumes form symbiotic relationships with Rhizobium bacteria which convert atmospheric nitrogen to a form usable by the plant. Good nitrogen fixation is essential for maximizing returns from a legume crop. Delivering high numbers of live Rhizobium at planting is often a challenge to farmers. Traditional peat based inoculant formulations can be difficult to mix over seed, fall out of suspension in water and tend to block fine spray nozzles when used through liquid injection systems. EasyRhiz freeze dried legume inoculant is soluble in water and has no particulate matter once dissolved so it passes through fine nozzles, mesh screens and/or fine orifice plates without blockage making the coating of seed or liquid injecting of inoculant an easier hassle free application process. EasyRhiz comes in a 2-pack kit and should be applied in moist seedbed conditions. Each 30mL vial treats 500Kg of coarse grain legume and comes with a 100g sachet of EasyRhiz Rhizobium Protecting Agent Soluble Powder which enhances cell survival through the delivery process to the furrow. 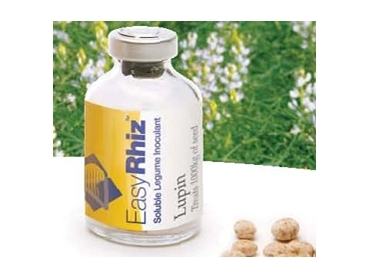 EasyRhiz and is available for lupin, field pea, faba beans and chickpea with other groups available on request.